Switching LAser Mode (SLAM) microcopy is an elegant and affordable technology that can almost double the resolution of any existing laser-scanning imaging system. Based upon the emission differential between Gaussian and annular laser excitation modes, SLAM works brilliantly with live and fixed samples and can thus be used on living animals. As opposed to other technologies that rely on light detection to enhance resolution, SLAM works at excitation and is thus compatible with descanned and non-descanned detection systems. Additionally, SLAM microscopy does not require special dyes or dye combination. Moreover, SLAM does not bleach or deplete fluorescence so samples can be imaged multiple times. 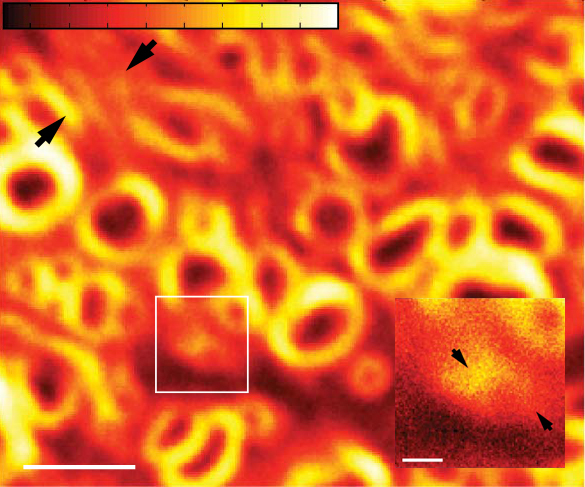 SLAM’s super-resolution applied to Coherent Anti-Stokes Raman Scattering (CARS) microscopy. Courtesy of Dr Daniel C. Côté, CERVO Research Center, Université Laval. Upgrade your microscope with super-resolution. The SLAM integration is simple and will not interfere with your system’s current features. The SLAM add-on is compact and fits into most commercially available systems. Confocal or multiphoton system, upright or inverted microscope, visible or infrared light, SLAM will significantly improve the resolution and quality of your images. Most importantly, the SLAM option can be powered off at any point using our user-friendly software. Resolution and contrast enhancement in cell cultures: comparison between conventional confocal microscope (“OFF”) and confocal SLAM images (“ON”). Tubulin labeling of neurons by immunohistochemistry (Alexa 546). 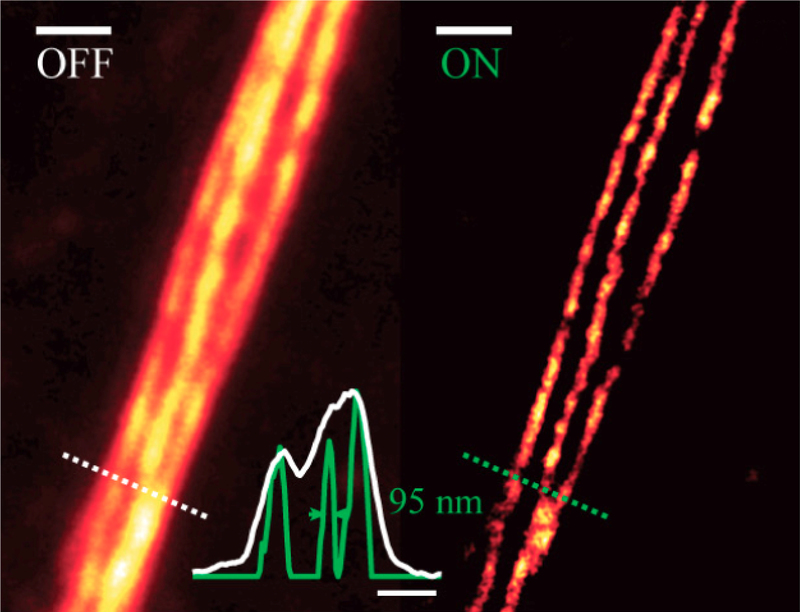 Scale bars: 1 μm. Profile scale bars: 500 nm. Courtesy of Dr Yves De Koninck, CERVO Research Center. SLAM microscopy is based on the acquisition of two images using two laser modes. The mathematical processing of these two images produces a final image that displays increased resolution. An animation of the SLAM technology can be found here (“Beyond the diffraction barrier”).